One-shots, transitions, drops, sweeps and swooshes are all types of effects that add those last finishing touches to a track. To help you add that audio 'cherry' Loopmasters have put together Subliminal FX: a library of 211 effects samples presented as 588MB of 24-bit WAVs. All the effects samples are separated out into four genres: Deep House, Tech House, Minimal and Techno. Each genre has its own tempo and further splits the effects down into types. The Techno folder, for example, contains effects categorised as hits, filter sweeps, drops, crashes, build-ups and breakdowns. Crashes are, on the whole, processed cymbal hits with some nice panning, reverb and delay applied. It's a shame there are no meatier impacts or blasts included to add more weight. I also found the drops were mostly focused on the higher frequencies, and really missed some heavy bass drops. Out of all the filter sweeps I liked the ones tied to a specific key best; they are more interesting, and more musical, than the rather bland-sounding noise sweeps. Just like the drops and crashes, the hits use lots of cavernous reverb and delay to good effect, whilst the Techno and Minimal synth build-ups seem to have the most character, using a pleasingly wider platter of sounds than just the good old white noise sweep. There are a lot of the latter on offer, used here as filter sweeps, breakdowns and drops. 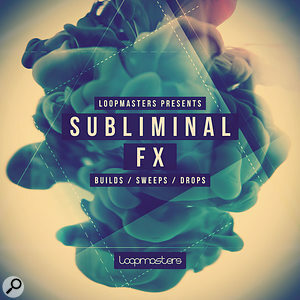 Admittedly, this sort of sound is still a dance music staple, but it would have been nice if Loopmasters had pushed the boat out to get some more wild, strange or just different sounds in there, if only to mix things up a little. The only section that really 'misses' for me is the Tech House drum rolls, which sounds like a bad General MIDI module demo. To finish things up, and as an added bonus, there's a full construction kit included for each of the four genres (in their respective tempos). These are well put together and sound authentic. I like the way everything is quite neatly labelled and organised, so if you're after a reverse or drop, for example, you know exactly where to look, which is certainly handy when working fast. Some of the labels can be slightly deceptive, however. For example, one breakdown labelled as being eight bars in length has the actual sound continue for two bars, with the remaining six being silent. It's not a capital offence, but why not just call it a two-bar breakdown in the first place? What did strike me whilst going through the collection was how similar the effects are that have been split into the four genres. Slightly disappointingly, apart from the difference in tempo (still a handy thing), there is very little to separate the actual sounds in terms of style. That's not to say the effects don't do their jobs here — they do — it's just that a little more variation between the genres would have been nice.